As an iOS Developer, I often have trouble updating to the latest version of Xcode since my 128GB MacBook Air keeps filling up. Common culprits include ~/Library/Developer/Xcode/DerivedData and ~/Library/Developer/Xcode/iOS DeviceSupport. By clearing out those two folders, I’m able to free up 11GB at this time of writing. For more information on what these folders contain, this was helpful. This entry was posted in Programming and tagged full, ios, memory, space, xcode on May 23, 2016 by Rex. The good news is that GameCenter can be added on after the rest of your application is ready. You should focus on your game mechanics, game engine, user friendliness, etc. After you are satisfied with the core experience, you can add GameCenter (leaderboard, achievements, and other features) afterwards. You can choose any application template and you don’t have to use SpriteKit. In my app, I had both a phone app & a watch app. You will need to implement GameCenter using Apple’s GameKit Framework. GameKit is currently only for the iPhone, so GameCenter logic needs to be called in the Phone app. Decide which Game Center features you plan to support. Define your game mechanics, keeping in mind the requirements and limitations of Game Center. Implement your game engine, ignoring Game Center for now. Focus on developing the other aspects of your game, such as your game engine and gameplay. You do this to avoid needing to create an iTunes Connect record earlier than you need to. As with any app, focus on nailing the key user experience. Then worry about implementing/integrating GameCenter in your app. This entry was posted in Programming and tagged gamecenter, gamekit, ios, xcode on May 20, 2015 by Rex. While working in Xcode and running my watch app on my actual hardware watch for the first time, I ran into this error on my watch the first time: “Failed to install [app], error: Application Verification Failed.” This stack overflow answer provides the solution, but I wanted help illustrate the steps I took to fix the error. Disclaimer: this worked for me, but there are probably more optimal ways of fixing the error. 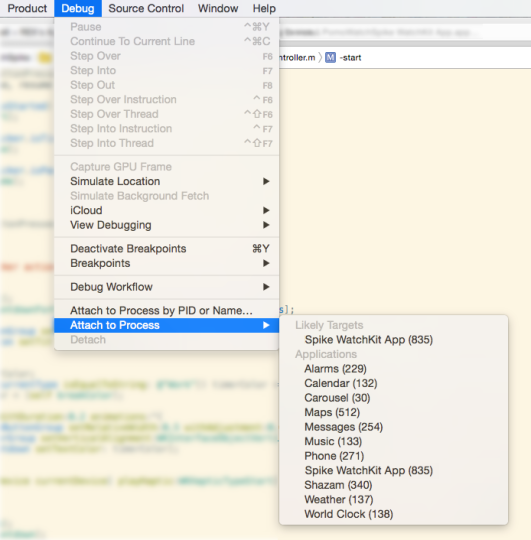 In Xcode, get the UDID of your Apple Watch (WIndow > Devices). The UDID is labeled “Identifier” and you can double click on the Identifier device hash to select & copy it. 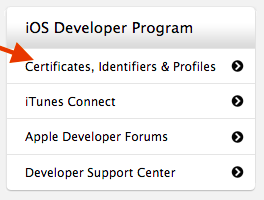 Visit the Apple Developer Portal at https://developer.apple.com/devcenter/ios/index.action and click on “Certificates, Identifiers & Profiles” in the right sidebar. Click on Devices > All in the left sidebar. Click on the Plus Sign (+) in the top right. In Register Device, provide a Name (whatever you want) and your watch UDID (from step 1 above). Submit the form to register your watch device. In “Certificates, Identifiers & Profiles”, locate your .watchkitextension Provisioning Profile for your app. Select & download this profile. Locate your downloaded profile file on your computer & double click the Provisioning Profile. Build your project and you will encounter a iOS Development Certificate alert. Warning, this step may be dangerous (proceed at your own risk). This worked for me. Click on “Revoke and Request”. This will revoke your current certificate and request a new one. You will probably get an email notifying you that “Your Certificate Has Been Revoked”. Run your Xcode project. Your watch app should now load the development build on your actual watch hardware. About the author: Rex Feng enjoys iOS development and has released Pomodoro Pro for the iPhone & Apple Watch. You can follow him @rexfeng. This entry was posted in Programming and tagged apple, debug, dev, hardware, ios, provisioning, watch, xcode on April 26, 2015 by Rex. Learning how to build a simple iOS app has not been bad. There’s a lot of learning how to find things in Xcode (protip: get a 2nd screen) and familiarizing myself with UIKit conventions. I completed the bitfountain iOS 7 course and have subscribed to more iOS newsletters than I care to admit. At a meetup last year, I had a discussion about my choice to start with Objective-C. He asked me why I didn’t jump into Swift or use a tool like PhoneGap. Fast forward several months to today, I’m very happy I went with Objective-C. Whenever I am unsure how to do something in Objective-C, there are endless helpful blog posts and StackOverflow discussions out there. Even blog posts written before 2010 can be helpful. I am truly standing on the shoulders of all those heroic individuals who’ve tread down the path before me years ago. With Swift, I’m sure there’s great documentation out there, but my guess is that Swift today (the beginning of 2015) cannot compete with the thoroughness of Objective-C edge cases discussed on the Internet. Access to simple, basic questions like converting a NSUInteger to a NSNumber are essential for those just starting out. I’d like to use the example of an extremely beginner friendly resource, RailsCasts, which taught you how to use run of the mill gems, like Devise, and helped create a new generation of developers. Without a wealth of beginner accessible resources, a language or framework can’t grow or grow as fast. 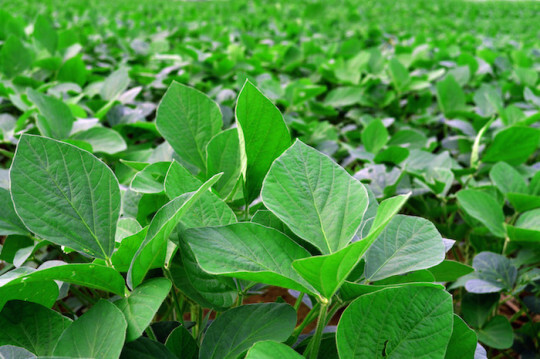 This entry was posted in Programming and tagged accessible, beginner, devise, ios, learning, objc, objectivec, railscasts, resources, swift, uikit, xcode on January 27, 2015 by Rex. When previewing a site on my iPhone (1136 x 640), I wasn’t satisfied with using my iPhone 5 or a Chrome browser Window Resizer app. 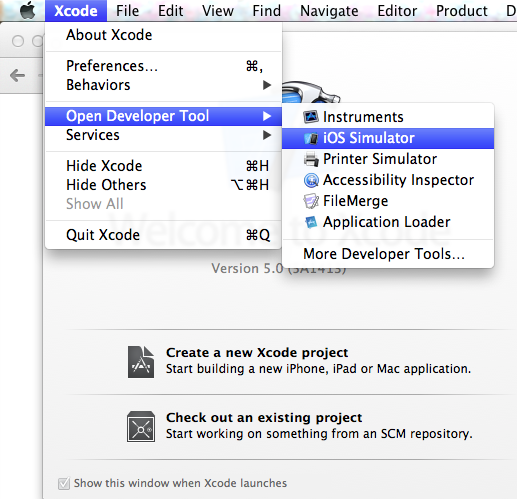 Turns out it’s super simple to use the iOS Simulator with Xcode on OS X (version 10.8.5). You’ll be presented with an iPhone to navigate within. 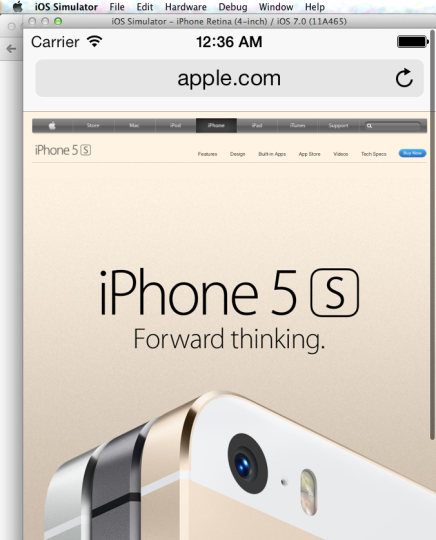 Select Safari and you can use a site like localhost:3000 for development. This entry was posted in Programming, Tech and tagged apple, ios, iphone, simulator, xcode on September 29, 2013 by Rex.